As usually happens to me, I randomly get a baking buzz, it just comes out of nowhere. This time I felt like baking something sweet, but in my attempt to follow some sort of healthy eating plan of late, particularly low-carb snacks, I decided to bake these healthy coconut cookies. I’ll probably get in trouble from my husband for calling them cookies considering I’m from Australia, but, coconut biscuit recipe just doesn’t have the same ring to it! I’ve become more and more aware of the amount of sugar I eat and have started to opt for alternatives in my cooking and in my coffee like coconut sugar or the use of honey. I understand honey is still a sugar but, honey does have health benefits and I find I need to use less honey to get the same amount of sweetness. This is one of the reasons I refer to these coconut cookies as low sugar coconut cookies because I find they have comparatively less sugar than most traditional cookie recipes but the cookies are just as sweet. 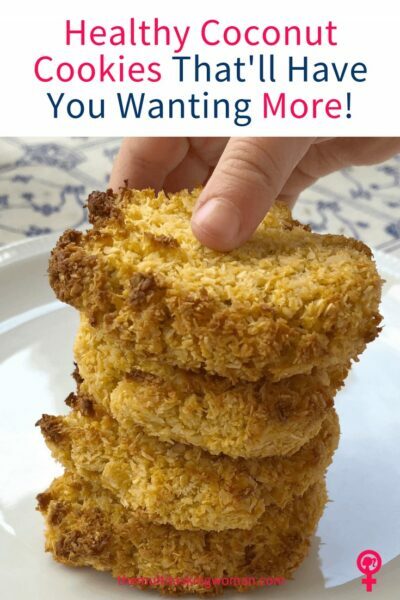 When I had my first one of these coconut cookies, it instantly reminded me of the delicious coconut macarons you can get from Woolworths or Coles, except, I knew my version was a whole lot healthier – gluten free coconut cookies with no flour or refined sugar, simply eggs, honey, oat flour and desiccated coconut. If you’re looking for cookie recipes without butter, this one is perfect too. It’s the coconut which crisps up when it’s baked, that makes these moreish and deliciously chewy coconut cookies! If you can part with a few, why not wrap them up in a beeswax wrap and gift them to a friend! Add the honey, oat flour and coconut to the eggs. Stir until well combined. Using a dessert sized spoon, scoop out spoonfuls and shape into a ball. Place on a prepared baking tray. With a fork, gently pretty the balls flat. I always know if the food I make is a winner when my kids eat it. My two year old daughter couldn’t get enough of these healthy coconut cookies and I didn’t mind her asking for another one. It’s also a winning recipe because I almost always have these four ingredients in the house and making a batch is so quick and easy; you don’t have to be a whizz in the kitchen to make these cookies! If you love these healthy coconut cookies, why not check my other biscuit recipes – Butter Biscuits with freezable dough, Jam Drops and Butterscotch Biscuits.